One of my favorite soups that I’ve made from the endless vegan cookbooks I own is this Mock Chicken Noodle Soup from Vegan Soups and Hearty Stews for All Seasons by Nava Atlas. When given a variety of options of what I dinner I might put together, my omnivorous husband frequently picks this soup. Instead of chicken, tofu is used. It’s great for when you’re sick or just want a warm, hearty soup on a cool fall or winter day. It is delicious and healthy to boot! 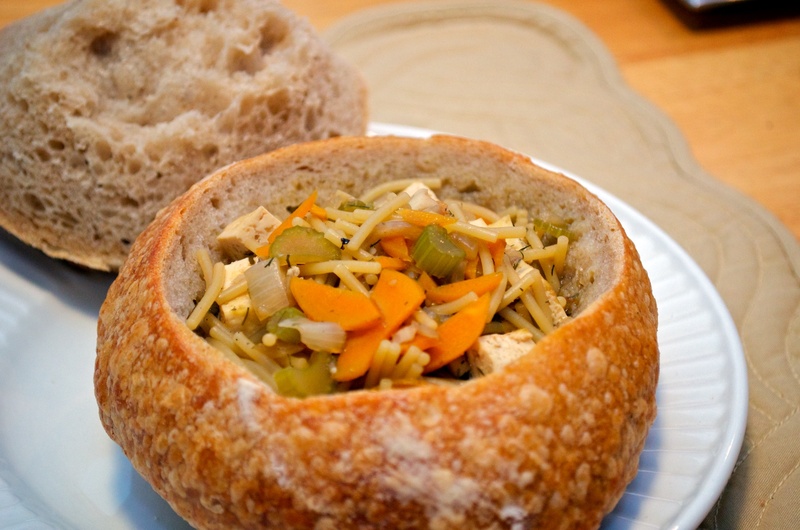 I’ve recently served this soup in a sourdough bread bowl from Ithaca Bakery. The sourdough soaks up some of the broth and has a wonderful flavor when scraped from the sides of the bread bowl. This recipes earns a 4 out of 5 carrots on the veganlicious scale!